We’re a new software company in Portland, Oregon founded to build products that enhance the cycling experience. Our first effort—the 529 Garage—is a registration and recovery service designed to put a dent in stolen bike trafficking. The 529 Garage allows cyclists to record information necessary for effective and fast filing of police reports and insurance claims in the event of bike theft. Shutting down this epidemic is going to take years, multiple tactics and the cooperation of many different people and agencies. As riders, we are all frustrated with the growing bike theft problem, and as a result our first effort as a company—the 529 Garage—is aimed at this problem. In an effort to determine the best possible approach, we are collaborating with law enforcement agencies, cycling organizations, manufacturers and bike shops. Nothing is foolproof. We don’t have it all figured out but we’re committed to a long-term, industry-supported approach. Just a few weeks ago, we introduced the 529 Garage at the 2014 Sea Otter Classic. Since then, we’ve gotten over 4,000 signatures for the petition and registered hundreds of bikes. The initial reception and ongoing response from those using the 529 Garage has been very positive and encouraging. What does this petition do? Crooks who are leveraging online sites as a scale channel to advertise their stolen goods will have a more difficult time selling. Victims will more easily be able to scan for their stolen bikes using technology. Increased awareness among both buyers and sellers will result in more honest sales and decreased fraud. For example, a car listed without a VIN number immediately signals a buyer to look deeper into the transaction and investigate a seller’s legitimacy. Isn’t this going to be a hassle for legitimate sellers? Selling a used bike legitimately isn’t a small amount of work, even without this step. Having registered hundreds of bikes, we can say with confidence that most sellers won’t be inconvenienced for more than a minute or two, even for the trickiest serial numbers. We’ve found that the average time to register a bike—including make, model, serial number plus 4 photographs—is about 4 minutes. Adding a minute or two on top of the process to prepare, list and close a bike sale transaction is not a massive inconvenience for a legitimate seller. And, it’s even easier if they’ve registered their bike in the past with services like our 529 Garage. What’s to prevent sellers from using fake numbers? Nothing. Serial numbers are not standard across bike manufacturers, so there is not a reasonable way to validate a serial number entry. However, when the buyer inspects the bike, they’ll know if the serial number doesn’t match what was posted in the listing, there’s a good chance it was stolen. Right now, many buyers don’t even think to ask to see the serial number. Raising awareness of bike theft as an issue and that serial numbers should be checked on any bike purchase is the primary motivation behind this petition. Not every bike has a serial number. How do you deal with that? Sure, a very small number of bike frames don’t have serial numbers. Having registered hundreds of bikes of all models, makes and types, our experience suggests this will affect less than 1% of bike transactions. A more common difficulty lies in reading (or locating) the serial number, and presents a bigger challenge affecting up to about 5%, potentially. Despite these small percentages, we’re trying to do a couple of things to help mitigate this concern and not marginalize those honest folks who sell bikes. First, we’ve created 529 Shields. These are highly tamper resistant stickers with serialized IDs encoded on them. 529 Shields can be adhered to the frame and serve as a unique identifier for law enforcement. It also allows the owner to place them in a more visible place than the bottom bracket which we believe will deter theft, much like an ADT sign in the front yard or in the window might deter a home burglar. Second, we’re engaging manufacturers about this problem and urging them to make serial numbers easier to read and more apparent to their owners. By driving the petition forward we can help signal to the industry that this is a problem cyclists are concerned about. By putting technology to use and writing software aimed at thwarting theft and aiding recovery, we’re demonstrating our commitment to the solution. Third, we need a solution that will work on the thousands of bikes out there that don’t have serial numbers, have been painted over, or are near-impossible to read. Requiring users to apply a tamper-resistant sticker to their bike is not ideal, but it’s “backward compatible”. Shields can also be used to protect other expensive components or items like bike trailers or expensive wheels. Serial numbers aren’t standard. How would this be enforced? We don’t see the different numbering schemes as a major blocker, but we are hoping to start a conversation about how we might, as an industry, make serial numbers a bit more useful. Our Shield IDs use a Luhn algorithm to check for correct entry. This same type of system would also work for serial numbers on frames. Standards like VIN and ethernet NIC IDs are helpful in encoding the manufacturer information in the ID itself. Once that conversation begins with manufacturers we can lobby them to make serialization more useful and apparent to owners. Won’t this just make it harder to track your stolen bike on mainstream sites like Craigslist and eBay? Like radar guns and radar detectors, any scale deterrent success will lead to creative ways to get around it; this problem won’t be solved by one tactic. Effective tactics will have to evolve as criminals find new strategies. Law enforcement personnel who have dealt with this problem daily for years tell us more than half the total number of stolen bikes are sold on eBay and Craigslist. These sites allow for easy, fast, low-risk trafficking. We would love to force crooks underground and increase their “time to sell” by a factor of 10. As we increase the effort and risk of selling, we will reduce the overall number of bikes stolen and help preserve the resale value of used bikes for legitimate sellers. There are already petitions for this on change.org. Wouldn’t it be better not to split up signatures? We found three attempts at petitions on change.org before we started ours. They are all closed now and were unable to effect policy change. We want to build on the awareness these pioneers created and initiate a dialogue among all stakeholders. Change often takes more time and persistence than one would prefer. Frequently, numerous attempts are necessary before before anything shifts. We’re running this petition through 5/29, working feverishly to get as many signatures as possible. We believe a strong and unified show of support will open up a constructive conversation with eBay and Craigslist, encouraging them to take a stand against stolen bike trafficking on their sites. Can you provide a link that doesn’t require Facebook, Twitter or Google+ login? Fixed! Initially, we did require social network login for the petition. However, we’ve taken your feedback to heart and made the change. We now have a simple 4-field text entry petition option. We still hope that once you sign you’ll spread the word on your social networks and help up gather more momentum to kick bike theft to the curb. Aren’t most of these thefts due to improperly locking bike—or not locking them at all? Actually, a large percentage of bikes which are stolen were in fact properly locked, or stored in what was considered a secure location, such as the family garage. 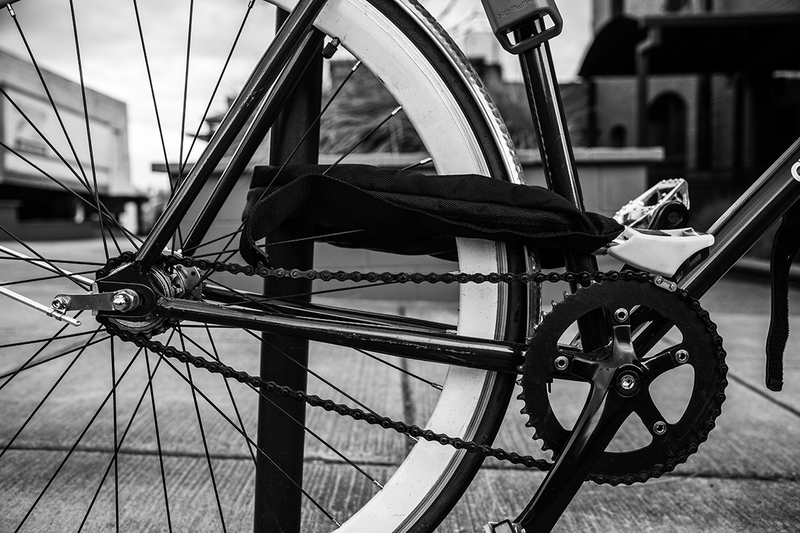 The occasional bike may be stolen due the owner’s failure to properly lock their bike, but the problem is much more extensive than that. Small-time crooks may be more opportunistic about going for unsecured bikes or cheap, easily broken locks, but large-scale organized theft rings have the resources to target “secure” property, such as bikes locked with cable locks, entire bike racks removed from cars (loaded with bikes) and home thefts. Locking is important, but it’s no guarantee your bike is safe. The fact is, that if you can say “I’ve haven’t had a bike stolen”, you are probably missing the word “yet” on that sentence. We’re not new to tech or to cycling, but we’re a new organization working on a huge problem with new partners and a new perspective. We welcome your feedback on what we’re doing. Let’s keep the conversation going and come together as a community to take a bike out of crime. Sign the petition and be sure to spread the word. The more people sign, the greater impact we’ll have. If a bike’s serial number is posted on an eBay or Craigslist page from a legitimate seller, then what’s to prevent a troll from taking that serial number and registering it with every bike registration site and police department he can find, and then claiming the listed bike is his? Thanks for the question. We’ll add it to the list. There are much easier ways to steal bikes than to file fraudulent police reports, particularly ones that the bike thief will have still have to prove ownership to law enforcement. If the seller is legitimate, they should have proof of ownership to counter any false claim. We recommend that legitimate owners register their bikes as soon as they get them along with proof of ownership such as the receipt (or the photo of one) and photos taken with the bike that pre-date the sale. This is a start but it should include pawn shop as well. Lots of stolen bikes end up in a pawn shop in a different city or state. And it should be required that all bicycles after a certain year when bought new has to be registered just like a motorcycle or any other vehicle, the bike shops could do this when the bike is sold. People with expensive custom bikes are not going to put a big sticker on it, and when you say tamper resistant, someone who’s going to sell, for example, an expensive custom Ti bike (which usually aren’t painted) is certainly going to be able to remove the thing. Also, something that not only mars the bike but that I have to pay you guys for is not a reasonable solution – for customs that don’t have a serial number, CL and eBay, etc. should just require a receipt from the manufacturer as well as the photos, and anyone who is going to buy a used custom bike should have no problem contacting the original manufacturer with the owner’s name and confirming it hasn’t been stolen anyway. Hey Jim, you’re right. There’s nothing stopping someone from being able to remove the 529 Shield other than time and effort. And, there are certainly some people who are very particular about the visual appearance of their bike. We appreciate that too. Let me explain a bit more about where we are coming from on this topic and thanks for raising it. First, it’s a signal to thieves that this bike, if stolen, will alert the 529 community and likely the owner’s social networks. Think of it like an ADT sign in a front lawn. Sure, they can remove it, but it doesn’t prevent the fact that there’s a bigger system trying to safeguard it. Third, the tamper-proofing is intended to deter the more casual thief. Yes, there are professional thieves out there that part out bikes and move product out of state and know the difference between XX1 and X7 groupsets and have specific tools that help them with their craft. Most thieves are not super savvy and are looking for a quick way to grab a bike and convert it into cash within hours or days of the theft and within a zipcode or two. The more inconvenient an owner can make it “at the rack” for a thief of this type, the more likely the thief will move on. Obviously, our small team has not created the silver bullet here that is going to stop this $400 million annual epidemic and the thousands of clever thieves that want to turn your bike into cash. However, we’re hopeful that with the cycling community’s engagement, the industry’s support and our efforts to build some software that can connect us together we can start putting a dent into this. We have ideas of more sophisticated things we can do, especially with manufacturers for new bikes, but this felt like a good starting point for the millions of bikes out there today that aren’t registered and that disappear every 30 seconds in the US. As far as requiring receipts, that feels like a long-shot to ask of Craigstlist and eBay, so we’re going to start with the simple serial numbers “as they ask for VINS on cars” as a starting point and hope you choose to sign our petition. And your point on expensive custom bikes is a good one and I appreciate some of the challenges you call out with this type of cyclist and higher end bikes. Perhaps we will see lower support from those folks as we grow for the reasons you cite. Thus far, I think your intuition might surprise you… we have a LOT of carbon secured in the 529 Garage and have heard lots of horror stories of losing high-end bikes and wanting solutions for customs, hand-builts and “China carbon” bikes that lack SN’s. Personally, I lost an incredibly custom carbon MTB years ago that was very distinct and informed and inspired what we’re doing. I used social media to find it, then tracked the thief down, then engaged law enforcement and helped them recover it. Once police had it, it took me over a month to recover it because the 42 unique points (including custom graphics, paint drips, alignment of tires to stems, scratches, etc) I could demonstrate with photographs were insufficient to “prove ownership” to the judge. And, while Santa Cruz (my sponsor) had a record of the sale, they didn’t have the serial number in their database! Eventually, I did recover it, only because I realized my Rock Shox SID had a serial number on it. Since I’m a member of a team and we order them in bulk, I was very fortunate that we had 6 forks with sequential serial numbers and that was enough to finally get it back. I spent an estimated 100 hours to recover that bike. Do I have a sticker on it today? Yup. We tried to make the Shield simple, small but visible, and attractive. It’s not a barcode or a QR code and it’s not 7 colors and it’s only an inch wide. After my incident, I want it visible, even on my custom frame that has airbrushed graphics under the clearcoat. We recognize other people might not feel the same way, so invite them to put it on the downtube or seattube above the BB maybe. Of course, it’s not required to be part of the system, it simply is a means intended to aid the 3 goals above. Thanks for your support and thoughts and hopefully this offers a bit more insight into our thinking and experience.